Though it was expected before year-end 2007, Adobe has opened the public beta of Photoshop Express, a Web-based version of its photo editing tool. 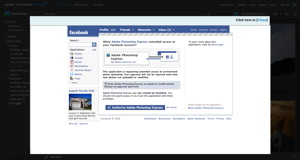 Users of Photoshop Express can upload photos directly or import their libraries from Facebook, Photobucket, and Picasa. 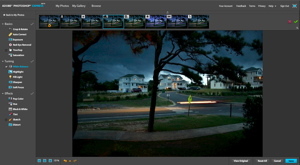 Yahoo's Flickr is notably absent, as the popular photo sharing site is partnered with Picnik for its editing features. However, Photobucket and Picasa already come equipped their own editing functions. Both offer similar tools with their hosting services which in some respects actually provide better results than Adobe's. Photobucket's relationship with Adobe in this respect is an interesting one, as the software company provides its Adobe Premiere Express for video editing on the media hosting site, but photo editing tools are provided by competing site FotoFlexer. User accounts come with 2 GB of photo storage, and photos pulled from partner sites do not consume any of that space. Further, any editing that is done to Facebook-hosted images requires Photoshop Express to be granted an additional level of access to your Facebook account, as the images are saved directly to Facebook instead of the Photoshop Express site. While the features provided by Adobe are entry-level at best, and offer little that other sites do not already offer, the power of the site comes from Adobe's brand name. Since the adoption of online "webtop" applications is still gaining momentum, participation by "big name" software providers like Adobe could help push such services into their next generation. Since last November, prospective customers have been expecting an offline-capable version of the Web application, using Adobe's AIR platform. That version may be forthcoming, as the current beta runs on the basic Flash platform, and is thus restricted to online use.